Gladys and Albert Newton and their seven boys moved to Garden Home in the early fall of 1935. Their eldest, Donal McIntosh, Gladys’ son by a previous marriage, was in his last years at Beaverton High School. Malcolm, Harley, Ted, and Jim entered Garden Home Grade School that year. Raymond and Rick were not of school age yet. Raymond started grade school there in 1938, Rick in 1939. The eighth Newton boy, Robert, was born at home in 1938. He started school at GH in 1945. The Newtons lived on Jaeger Avenue (now 74th) just south of the Salem branch of the Oregon Electric/SP&S railroad. (There is some confusion over the spelling of our street name. Street signs in those days had it “Jaeger.” Some have written it as “Jager.” We prefer the former.) Closest neighbors of the Newtons were the Mays, Jacokes, Powells, Scherners, Hogans and Waldeles. Other early Jaeger Avenue neighbors included Blust, Norris, Porschman, Singletary, Smith, Sutter, and Taggart. Mundens moved into Taggart’s house when he moved from Garden Home. The Mays lived across the tracks from the Newton place. William May was a candy maker for Meier and Frank Department Store. On occasion he made candy ­­–– which many of us sampled –– in his basement. The Mays had fine vegetable gardens and fruit trees, as did many families in Garden Home. The May children, Lois, John and Bill, were classmates of Newton boys at GH School. After the Japanese attack on Pearl Harbor, “Old Man” May—as we called him—was the local Air Raid Warden. His job was to see that all neighbors had lights-out when the air raid siren blew. The Newtons didn’t turn out their lights; they put “Army” blankets over the windows. It was a scary time for the younger Newton boys. The air raid siren atop Upchurch’s store only blew when tested. (More about that siren later.) Incidentally, we never heard of any Japanese incursions into Oregon territory during the war, only after the war. There was an incident, however, near Garden Home that was rather frightening: A P-51 fighter plane crashed along the railroad tracks between 80th and Washington Drive about a mile from the Newton place. Bill Norris and Rick picked up live ammunition there after the wreckage was removed. It was rumored that the pilot by the name Harris parachuted to safety before the plane crashed. The Jacokes lived just down the road from the Newton house, across Alden from Powell’s Kennel. Oscar Jacokes was a custodian at GH school. We know he had a daughter, Darlene, and a grandson, Steve Hiatt, both of whom lived with the Jacokes for a time. Oscar did most of the work on the Jacokes house. He once said he intentionally did not finish the outside of his house so that his property taxes would not be as great. My brother Robert still recalls the odor of sawdust mixed with O’Cedar that Oscar used to sweep-shine the school’s basement and gymnasium floors. Harry Powell owned the kennels on Alden at the southern foot of Jaeger Avenue. Most of the Newton boys worked at the kennels at one time or another. Harry was a fair-minded fellow but of few words. He boarded a variety of dogs, owned by folks whom we considered affluent. He also raised Wirehair Terriers and Greyhounds — dogs not buses — and he often took in the dog races in Portland. From our yard we often heard Harry yell at the barking dogs, “Shut up, down there!” His daily ritual included a drive to the Post Office in his early-‘40s Buick woody station wagon to pick up his mail. The Powell’s had a daughter Dorothy who, with her husband Byron Meisner, took over operation of the kennels. Detlef Scherner farmed several acres on the side-hill adjacent to where Royal Avenue turned into Alden. There also was a Scherner couple that lived on Alden next to the Jacokes. The two Scherner families were distant relatives — very distant. The Scherner children, Margaret, Pete and Rhinehart “Duke” lived on the farm. Margaret was in the first class at Garden Home School. Duke played baseball on the local semi-pro team and later, after moving into his own home, lost his life in a fire. Pete often brought his team of horses to the Newton place to plough the large garden plots. He also helped butcher hogs for the Newtons. In 1935, Margaret Scherner Smith moved back to the farm with her mother Marie and her son Donald. Donald entered the second grade at GH School and was a classmate of Jim Newton. Margaret Scherner Smith was the Postmaster at Garden Home for many years. I was among the Newton boys who “helped” at the farm during haying season and drank sweet water from Scherner’s well. The old farmhouse probably was the last house in Garden Home to get electricity. Until the early ‘40s, coal oil lamps provided light there. Hogans lived in a small old house directly to the south of the Newton place. Until the early ‘40s, it was one of a few houses still with an outhouse. While living in the small house, Mr. Hogan built a larger home alongside the old house. The old house earlier had belonged to the White family. Jack and Charlotte White went to GH School for a short time. Hogan’s daughter, Molly Ann, was brother Robert’s age — and young allurement — and in his class at Garden Home School. The Whites grew mushrooms, Hogans raised chickens. As a young paperboy making monthly collections from two Sutter houses, I could not understand why Adolph Sutter lived in a house next to the Porschmans and his wife Therese Sutter lived in another, smaller house across the street. Both houses were on Stewart Street. Sutter was the “water man,” doing most of the work of the water district with his helper Johnny, who lived with Mr. Sutter. Mme. Sutter taught French in her home and may have taught elsewhere as well. She resembled Julia Child in both appearance and accent. As far as we know, the Sutter’s had no children. Rumor has it that Mr. Sutter succumbed to a very bad case of poison oak or ivy. The Erich Porschmans lived on the north side at that which was the end of Stewart Street. Erich was an appliance repairman, and both he and his wife were artists. Mrs. Porschman also was a teacher. Glen and Aileen Singletary lived next door to Mrs. Sutter. Glen was an upholsterer and worked at Fields Chevrolet in Portland. He also did auto upholstering at his garage shop. He made excellent white tops for ’48 Ford convertibles. The Singletarys had two children, Donald and a very attractive Betty. William and Ellen Norris lived on Jaeger Avenue near the northeast corner of Stewart Street. The Norris family moved to Garden Home from Oklahoma in the early ‘40s for work in the Kaiser shipyards. They had two children, Eileen and Bill. Both children attended Garden Home School. After World War II, Mr. Norris worked at a Portland battery company and eventually took a job as custodian at Garden Home School. Ellen worked in the school cafeteria. Daughter Eileen married and she and her husband had three children, one biological and two adopted. The motive is not known, but as an adult the biological son shot Eileen to death as she sat reading. He later took his own life as he was about to be apprehended. Mr. Norris and Emma Hickman were siblings. The Hickmans lived on a farm on a dead end road, which became Miles Court across Oleson Road from the Gertsch dairy farm. The Hickmans had two children, LouAnn and Clark “Doc,” both of whom attended GH School. Emma Hickman lived to be 103 years old. The Karl Blusts lived on Jaeger Avenue two houses to the north of Norris. Mr. Blust worked as a cabinetmaker in Portland. 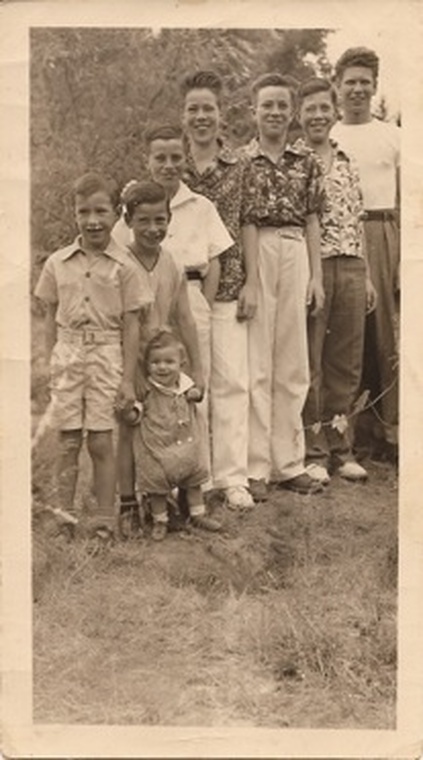 Victor, the only Blust child, attended Garden Home Grade School and was a classmate of brother Raymond. Victor — for some reason we called him Gismo—was an excellent athlete. He played baseball at Tigard High and in American Legion. He also played basketball and football. Etta Smith lived three doors north and on the other side of Jaeger Avenue from the Blusts. Etta had three boys. Her oldest boy, whose name we remember as Emmett lost his life in the European Theater during World War II. The second son, Buddy, became a lawyer and was a county attorney in Klamath Falls. Then Don, who may have attended Garden Home School briefly. Etta also had a daughter: Ellen. Ellen was in Rick’s class at Garden Home. She became a school’s superintendent in Cornelius. She died at a relatively early age. Etta worked in the GH School cafeteria. She also made marvelous pies at her home. Brother Robert still remembers the smell of the pies as he passed the Smith house on his way home from school. Raymond would occasionally buy one of Etta’s chocolate cream pies for .50-cents and devour the entire thing on the way home. Both Raymond and Rick often hung out at the Smith house — basically because Ellen’s friends, Joanne Day and Pat Trainer, sometimes hung out there as well. Joanne and Pat were cousins. Don Smith and Joanne Day were married in the early ‘50s. Edward T. Taggart, for years a Garden Home School Principal and teacher, lived with his wife Annabel next door to the Smith house, although probably not at the same time as the Smiths. Taggart was a relatively strict disciplinarian, but fair. A whack on the hands with a ruler or willow switch got the attention of naughty students. When a fellow classmate had to repeat a grade the second or third time, brother Jim and some other boys tagged him with a disparaging name. Taggart warned the boys to stop; they did not. Taggart lined them up for punishment with the willow switch. As Taggart approached John May, John began to cry. Taggart stopped the punishment, and the kids stopped the name-calling. Oh, Jim avoided the switch. He was in line after John. The O. J. Mundens moved into the Taggart house after Taggart left. They had three boys, two of whom were from Pearl Munden’s previous marriage to Sid “Rookie” Ralston. Rookie was an early custodian at Garden Home School and was a member of the Garden Home semi-pro baseball team. Pearl and Rookie’s boys, Myles and Bill, attended GH School. Pearl was left as head of the household when Mr. Munden took his own life. She was an excellent seamstress and kept busy making clothes and doing alterations for many local folks. Pearl made gowns worn by Dorothy Johnson as Dorothy made her way through competition that led to Dorothy’s selection as first runner up in the 1955 Miss America pageant. Dorothy was the daughter of Gus and Jean Johnson. Dorothy attended GH School, as did her sister Shirley. As we mentioned earlier, Dorothy was in a number of “beauty” pageants that led her to Hollywood filmdom. Purportedly, the reason she did not become Miss America was her answer to a final question: She wanted to marry a millionaire. She did; one of the Hiltons. Gus owned the Garden Home Garage at the southwest corner of the intersection of Oleson and Garden Home roads. Gus was good to all the kids who would take their cars there and borrow Gus’ tools. When Gus was busy inside the garage, many of us kids would pump gas to be helpful. When the air raid siren I wrote about earlier was removed from the Upchurch store, it was stored in Gus’ garage. Bill Norris and I thought it would be fun to hook it up to a battery and let in blow. We did and it did and several of us lost our hearing for a couple of hours. Gus bought the Hill house and developed several acres of land on the east side of Oleson Road south of and across from the garage. We know nothing of Mr. Hill, but Mrs. Hill was a schoolteacher. She had two goats and a filbert orchard. The Hill house is one of the few original houses still standing along that stretch of Oleson Road. The Garden Home Garage was removed after the Johnsons moved to Southern California, and it was replaced by a more modern service station. George Oules ran the newer station for several years after his parents’ Raleigh Hills store/gas station was closed. Brother Jim was George’s best man when George was wed to Pat Trainer. Donal McIntosh, the eldest of the eight Newton boys, worked at Powell’s Kennels and, as a teen-aged student, cooked at the Portland Golf Club. He was attending the University of Oregon when WW II broke out. Donal married Kathreen Genge and had four children, Donal, Patricia, Jock, and Susan. The kids attended school in Tigard. Malcolm delivered papers, picked berries and filberts and milked Hill’s goats. Harley did much of the same, and he also worked at Powell’s Kennels, caddied at the Portland Golf Club and worked for Burt Waller, Aaron Frank’s groundskeeper. Frank was a principal in the Meier and Frank Department Store and owned the Frank Estate off of Oleson Road not far north of the GH School grounds. Harley and Aaron Frank’s son Gerry were about the same age. Harley doesn’t remember Gerry pulling any weeds, but he does remember pulling stunts on Gerry. One of the favorite stunts was when Gerry was riding his motor scooter, Harley and some other boys would lift the rear of the scooter so it couldn’t go anywhere. Gerry Frank didn’t attend Garden Home School, he went to Ainsworth. The “Farm,” as Frank called it, was bordered on the south by the Forest Grove branch of the Oregon Electric/SP&S railroad. That was handy for Mr. Frank as he often loaded horses onto the train at Firlock Station for transport to various shows. We don’t remember the year, but one night the locomotive that was pulling a log train traveling alongside the Farm derailed. We were among many Garden Homers who ventured down the tracks to view the humungous, steaming engine lying on its side. But I digress. Malcolm went on to marry Adele Riggs and had four children. Harley married Lois Hebison and had four children, Sharman, Randy, Denny and Tracy. Malcolm’s kids, Alex, Elizabeth, Margaret and Josephine, were the eighth through eleventh Newton to attend GH School; the most of any Garden Home family. Josephine not only attended Garden Home, after university she taught lower grades there. Brother Ted did everything that one could do at Michael Maruggs’s dairy farm; milked cows, processed milk, fed and cleaned up after the cows and drove delivery truck. Clark Stephens says he once rode with Ted — one of the wildest rides he ever had. Ted married Marian Wiant and had two children, Lorene and Gail. Jim also worked at Powell’s Kennels, milked Elsie and Fanny, the Hill’s goats, and harvested their filberts, milked Glenn and Isolda Steele’s cow and caddied at the PGC. Glenn and Isolda Steele lived on what is now 70th Avenue to the north of the intersection of Multnomah Boulevard and Garden Home Road. As mentioned earlier, Mrs. Steele worked in the school cafeteria. Always a treat for Rick was to walk down the railroad tracks with Jim to the Steele’s barn and stop along the way at the Red and White Store and have a Nehi Orange. Much of the milk Jim drew was sold to Steele’s neighbors. Along with our dad, Jim also volunteered to do a lot of the plumbing to get Whitney’s community cannery up and running. Jim married Eleanor Avolio and had two girls, Christine and Sharon. Raymond worked at Powell’s Kennels for years, and he too caddied at PGC. After the Korean War, he went to barber school and worked for 26 years at his own shop in Oregon City. The Depot Barber Shop was — and is –– the oldest operating shop in Oregon. Raymond married and had two children, Linda and Kelley. Rick worked at Powell’s Kennels, delivered papers, caddied, worked at the Hickman farm and did odd jobs for several neighbors. At the age of 14, he drove milk truck for the Raz dairy. A friend of Rick’s and many others in Garden Home was Cecil Blachley who operated a shoe repair shop just east of the Upchurch / Throckmorton store. Cecil would often startle unknowing youngsters by stabbing his wooden leg. Rick and his wife, Liselotte Pallor had two children, Toné and Jeanette. Robert caddied, picked berries, and worked at the Oules’ Raleigh Hills gas station. He also helped at Tom Perkins auto shop and Roy Ernstrom’s shop, both of which were on Jaeger Avenue. Robert was among those of us who delivered papers but made little money at it because many customers did not pay at collection time. But his favorite “job” was volunteering in the school cafeteria and joking with the ladies, Etta Smith, Isolda Steele, Ellen Norris and Betty Waldele. Robert married Linda Koellermeier and had three children, Darrel and twins Derek and Darren. All the Newtons did military service. Our dad was in the Canadian Army and fought in France during the First World War. Donal was in the Army National Guard when World War II broke out but was discharged because he was not a US citizen; he was born in Canada. So he went to Canada and joined the Royal Canadian Air Force. (Donal became a naturalized US citizen in 1952.) Malcolm and Harley joined the Navy early in World War II and served in the South Pacific. Ted also went into the Navy during WW II. His service took him throughout the South Pacific and Asia as a shipmate of a young Mark Hatfield. Jim served in the Army National Guard prior to the Korean War. Raymond was in Korea in the Army. Rick also served in the Army in Europe and Vietnam. Robert was in the Navy in the Far East during the Cold War. Recollections of Harley, Jim, Rick, and Robert Newton; remembering their deceased brothers: Donal McIntosh, Malcolm, Ted, and Raymond Newton. The Newtons at Garden Home School 100th Anniversary. 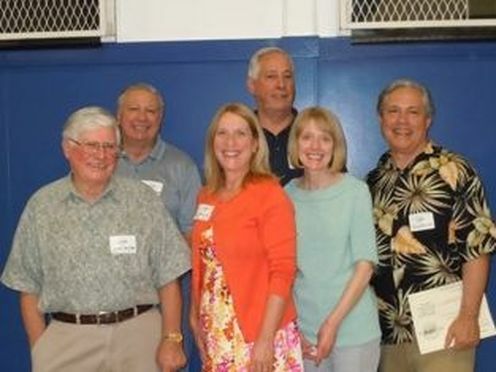 L-R: Jim Newton, Robert Newton, Josephine Newton Aust, Rick Newton, Margaret Newton Shrader, Alex Newton. This entry was posted in Memoirs, People and tagged Jaeger, Jager, Johnson, Newton, Porshman, Throckmorton store. Bookmark the permalink.